St Vincent and the Grenadines would consider changing its support for Guatemala getting a United Nations Security Council seat if the United States would consider funding the construction of the Argyle International Airport. “I told her if she wanted us to consider supporting Guatemala instead of Venezuela that the US had to be willing to spend the same amount of money that Venezuela is spending on the International Airport and she said that they couldn’t do that,” Sir Louis told the SEARCHLIGHT. Straker said that in addition to the fact that Guatemala had continually objected to preferential treatment for the Caribbean banana industry, St Vincent and the Grenadines could not ignore Venezuela’s contribution to the airport and other important projects here while America had not contributed “one penny”. “America did put pressure on us and others to vote for Guatemala but it would have been bad foreign policy on our part considering the relationship we have with Venezuela,” he said. When SEARCHLIGHT contacted the US Embassy in Barbados, Ambassador Kramer had already left the post but Julie O’Reagan of the Public Relations Department said the conversations with foreign ministers could not be disclosed but said that as a matter of policy the USA is not giving assistance to countries for construction of buildings. “We are more into giving technical assistance for nation building, assisting in the fight against HIV, anti terrorism and so on,” she told SEARCHLIGHT. Reagan said that she can also confirm that the USA considers it crucial to monitor which country gets unto the UN’s Security Council and would not be surprised that such a discussion would have been held between any USA ambassador and officials from any country they visit. Meanwhile St Vincent and the Grenadines was among ten CARICOM nations which have been criticized by the US-based Caribbean Guyana Institute for Democracy (CGID) for signing an OAS declaration criticizing the US “fence law”. That is a law that empowers the country to build a fence on the Mexican border to stem illegal immigration. 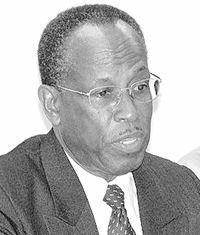 CGID president, Rickford Burke, said that the CARICOM states continued to make foreign affairs blunders inadopting an “anti-US foreign policy posture”. Sir Louis dismissed the criticism and said that even Guatemala signed the same declaration which said that the construction of the wall goes against the spirit of how problems should be solved between neighboring countries. Ambssador Kramer in an article circulated to OECS media said that the USA and the Caribbean states have many core values in common which disagreements could not uproot. With these shared core values, the issues on which we disagree do not prevent the bonds of friendship from continuing,” she wrote.